Do we have the right seats (roles defined in the company)? Are the right people in those seats (do they possess the proper skills, talent and abilities necessary to succeed)? Are the right people in the right seats doing the right things? (Are they focused on the most important priorities each quarter, month, week and day?). In Three Tools to Define Your Leadership Team we briefly discussed your organizational structure and how to determine with this tool who should be part of your leadership team. Positioning Systems and Gazelles People Organizational Structure tool is not about building an organizational chart. (You should have a written (documented) organizational chart with each position (role) title and the name of the person occupying that role that is current within the past 90 days. This tool can be utilized to help identify key seats in your company) It’s more to identify key seats, where there are problems and how to measure each of the key seats in terms of measurable outcome they need to produce. To the right you will see an image of this key seats organizational process structure we use with our clients. (Should you like a copy of this just send me an email with Organizational Structure in the subject.) In the immediate left hand column we’ve identified many of the key positions a mid-market sized business might have. 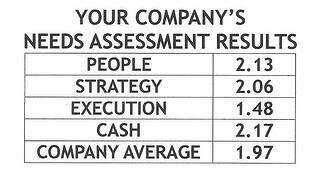 You’ll need to review this and make your adjustment for the key seats you have for your company. 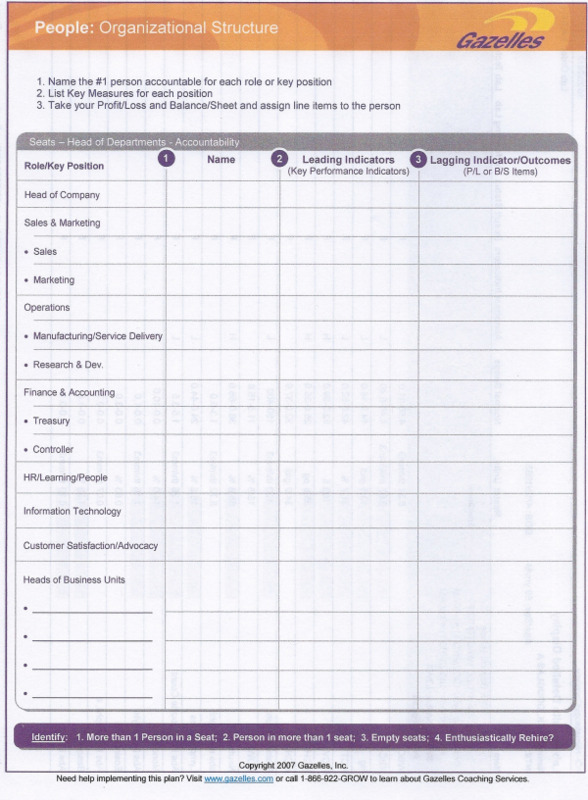 In a group meeting ask each your leadership team to fill out this first column individually identifying who is responsible for each key seat. Do we have any seats (roles) that have 2 or more people occupying it? In each key seat discover whether or not you have included more than one person’s name in the box. For example one of my clients had the owner/president and another leadership team member included in the Sales & Marketing seat. Having two members occupying any of these key seats sends mixed messages and confuses your team who they should be reporting to. No one wants to have two bosses, yet by having two members occupying one key seat that’s exactly the message you are communicating to your team. One person only should be accountable for each position. Do we have any team members (leaders) that are occupying too many seats (to be effective)? Occupying multiple roles is a common problem in many organizations where either the leader/entrepreneur has taken on too much responsibility and doesn’t wish to let go or they’ve simply grown too fast and not realized how many positions they are occupying and how they are bottlenecking the company’s growth. Regardless it’s a situation where someone in more than one key seat is often spread too thin and is thus ineffective. Are their seats (roles) we have empty (no one accountable for them) or have roles we have not defined that we desperately need to succeed? As noted in Customer Advocacy, often companies fail to realize the critical value of this role. If the role of Customer Service (Care) did not exist, there is no one accountable for Customer Satisfaction. Lacking little if any customer feedback, customer satisfaction will certainly suffer. This isn’t the only key seat that may be unoccupied, however it is frequently the one we see that is often not even identified as a key position. If you go through this exercise with your leadership team you will often quickly identify and realize why your business is struggling to grow. Confusion with accountability, one key person occupying too many key positions, and a lack of anyone filling key positions are serious challenges for any business to overcome. If you’re business is in growth mode it’s almost impossible to gain traction with any one of these crucial missteps. As noted in Three Tools to Define Your Leadership Team it’s a good idea to have a facilitator work with you to help you identify these key positions to help objectively discover where you have these issues. Just as importantly having your leadership team do this exercise on their own during the meeting and comparing their results often realizes different answers than what the CEO/president might be seeing. Once you’ve completed this portion of the exercise make a point of developing an action plan for resolving the multiple people in key seats, leadership occupying too many seats and identifying critical empty seats so you can realize the benefits of this tool. Finally you will want to place your Leading and Lagging indicators for each position. Keep in mind the crucial importance of determining leading indicators. A good lead measure has two basic characteristics: It’s predictive for achieving the priority or measurement, and it can be influenced by the team members. Lagging indicators are usually much simpler to identify. Unfortunately they are also in the past so cannot predict nor be changed by your team once they’ve been reported. These measurements are critical to providing accountability. If you’ve done a Topgrading Job Summary Scorecard these should be the accountabilities you’ve documented for each position for your hiring and annual review process. Next blog I plan to offer some thankful thoughts as part of my Thanksgiving. Recently one of my client's used the cost of mis-hire tool on Topgrading.com to discover the cost of a recent hiring mistake. A two month employee cost the company over $15,000 in business costs. We’ll review this tool and ask you to consider how much the wrong hire costs in your organization when the blog continues after Thanksgiving.